Sabeen Ali (Pakistan/Saudi Arabia) is a prominent short story writer, poet and literary critic from Lahore, Pakistan. 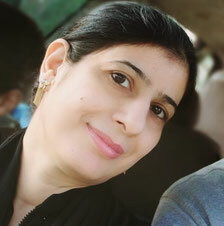 She postgraduated from University of Agriculture Faisalabad, Pakistan with distinction. Her writings have been published in renowned literary magazines. Sabeen Ali has a great interest in fine and applied arts. She expresses her thoughts in Urdu and Punjabi with equal ease. The noose was getting tighter around him; surrounded by people armed with bayoneted clubs and drums. But he wanted to tell the whole story, which began years ago, to his six children. Stories never completed so easily. From Lions and Mice to the Aborigines who had not even been valued equal to the Kangaroos. The dream to conquer five Oceans; No, No it wasn’t a dream but trade was the greed. The same greed which brings a donkey with keen desire to the greenery of the dense forests; but they weren’t donkeys. They were cleverer than cunning fox, smarter than Kea, and way more dangerous than Rattles. From West to East there wasn’t a single spot on earth where they haven’t marked with their sharp-edged claws. On any coast their ships have anchored; have ravaged the settlements around. The inhabitants of those lands, including humans, birds, and animals became extinct so fast that they hadn’t experienced such tragedies even in centuries. There, shower of arrows been launched. God Save the…….laid desolate the whole continent; new settlements will habitat there, where civilized nations would have dwelled. Few coins would be the reward of one life…..God Save…. This creature is worse and worthless than a Kangaroo, let’s shoot him. Get every healthy being conscripted. Bloodiest war of this planet is about to be fought. Secure the food grain……. Let’s set up the famine White blood is of highest value. This woman has pointed the gun…..let’s imprison her for life….God Save….. He is our ally, save him What if he had publicly killed three useless men of a poor country? Throw dollars. Only forty nine thousand dollars…. Whether they are the spies or the dentists have returned their own country. All the legal formalities have been completed. Let’s cry over spilt milk Feel repentance on those instrumental rulers. The slogans of ‘God the Save the King’ have echoed in his ears for centuries. The sounds that would have vanquished him. He was not the King Wasn’t the beast as well. Those are actually the Kings who have the power to make pieces of paper equivalent to Gold Power to destroy the earth in the blink of an eye, power to control the air and the oceans Pieces of paper have won. And animals; they have no value. The stories have never ended. Sithi uhhmm ingonyama Ingonyama Siyo Nqoba [We’re going to conquer]. God save the king was the National anthem of Great Britain and many other countries which were the colonies of Great Britain in the Eighteenth and Nineteenth centuries. اس کے اطراف میں گھیرا تنگ کیا جا رہا تھا. چاروں طرف ڈھول باجوں اور سنگینوں سے لیس لاٹھیوں نے اسے گھیرے میں لیا ہوا تھا. مگر وہ اپنے چھ بچوں کو مدتوں سے شروع کی گئی کہانی مکمل سنا دینا چاہتا تھا. کہانیاں اتنی آسانی سے کبھی مکمل نہیں ہوتیں. شیر اور چوہے سے لے کر خوب صورت بارہ سنگھے اور دو سینگوں والے فاتح سے لیکر ان ایب اوریجنلز تک جن کی قدر کبھی کانگرو کے برابر بھی نہ رہی تھی. اس کا سانس پھول چکا تھا. پانچ سمندروں پر حکمرانی کا خواب…. نہیں نہیں …….وہ خواب نہیں تھا حرص تھی. تجارت کی منافع کی منڈی کی حرص تھی. وہی حرص جو ایک گدھے کو ہری گھاس کی چاہ میں گھنے جنگل میں گھیر لاتی ہے مگر وہ گدھے نہ تھے وہ لومڑی سے زیادہ شاطر ، کی یا سے زیادہ سیانے اور ریٹل سے زیادہ خطرناک تھے. انہوں نے مغرب سے لے کر مشرق تک کوئی قطعہ ارض نہ چھوڑا جہاں اپنے نوکیلے پنجوں کے نشان ثبت نہ کیے ہوں. ان کے سفینوں نے جس ساحل پر بھی لنگر ڈالے وہ بستیان تاراج کر دیں. وہاں بسنے والے انسان چرند پرند حیوان سبھی انواع اتنی تیزی سے معدوم ہونے لگیں کہ صدیوں نے ایسے سانحے نہ دیکھے ہوں گے. تیروں کی بوچھاڑ شروع ہو چکی تھی. لاشوں کی بنیاد پر نئی کالونیاں تعمیر ہوتیں اوہ گاڈ سیو …. اس سیارے کی سب سے خونیں جنگی لڑی جانے والی ہے. سفید خون کی بڑی قیمت ہے. اس عورت نے بندوق تان لی تھی… تاحیات قید میں ڈال دو …..گاڈ سیو…. کیا ہوا جو سرعام کسی غریب ملک کے دو تین بیکار انسان مار دیے. جاسوس ہوں یا ڈینٹسٹ اپنے ملک لوٹ چکے. کف افسوس ملو ان گماشتے حکمرانوں پر …. اس کے کانوں میں گاڈ سیو دا کنگ کی صدائیں صدیوں سےگونج رہی تھیں. وہ صدائیں جو اسے معدوم کر دیں گی. کنگ وہی ہیں جن کے پاس کاغذ کے ٹکڑوں کو بھی سونے کے مماثل قرار دینے کی طاقت ہے. کنگ ہمیشہ بچا لیے جاتے ہیں. پس نوشت: افریقی لوگ گانے کا اردو مفہوم.